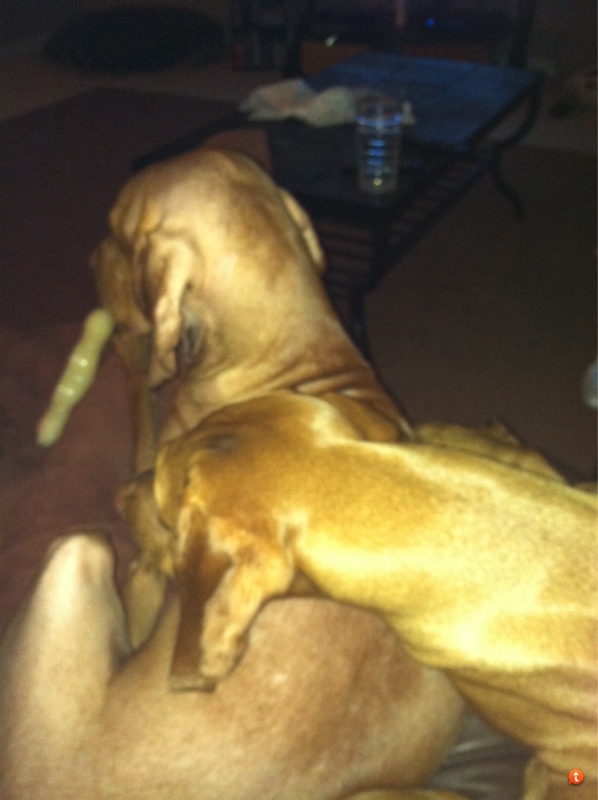 Hungarian Vizsla Forums > General Vizslas > General Vizslas > Considering owning 2-need advice please! Considering owning 2-need advice please! We have an almost 8 month male and our breeder has a 2 year old male for sale. His family had to give him back due to a divorce they are going through We have an appointment to see him tomorrow. According to our breeder he is well trained and housebroken. He is used to being with another V because he was raised with his sister. The family kept the sister. We have considered owning two dogs but we don't want to go through the "puppy stage" again. That's why it's appealing that this V is 2. We think owning another might change the dynamic with our boy now. Have any of you experienced this? what are the positives to owning two? Are they happier with another dog in the household? Any advice is greatly appreciated! Thank you! Re: Considering owning 2-need advice please! We have 2 and love it! We wanted a rescue originally for our second who would be older than our first, but our breeder did not feel comfortable with that as Miles is on the submissive side and can be fearful. We worked really hard with him to get him where he is at now and she didn't want to see him regress. She thought a puppy would be an easier transition. Ask your breeder or trainer for input! Give it a "test drive" and take a walk in the hills for a few hours before you bring the older boy home. See how they react. One will become the dominate dog quickly, as we found when we brought our second one home. You don't get to decide which is dominate. They do that on their own and that is how it will be. You will have to let them work it out. Maybe a few walks first, but it sounds like a good fit. We own a pair and it's like shoes. One just doesn't do much once you experience two. I'm really interested in this and would agree with Redbirdog they would need some time together on neutral territory doing 'the walk' to see how they engaged and what sort of relationship was likely to develop. I find it fascinating the way dogs connect to each in different ways. Like people, they can forge really strong bonds, or not gel at all - it's all down to the particular dynamics between the dogs. The only thing I would add though is that when Burdy was 8 months old she loved EVERY dog she met with a passion, except one. There was a 20 month old powerfully built german pointer who she was terrified off. When she glimpsed this dog she would cry and hide behind me or conceal herself in a hedge. However, this german pointer became Burdy's absolute best friend of all a few months later. It was almost as if the energy of the german pointer had frightened Burdy until she grew to be the other dog's match. After that they tried to become inseparable. My point is your pup might show a nervousness at this age which he would not exhibit if he was a bit older. It's tricky. You will just have to take it slowly and it may all be fine. Just in response to SteelCityDozer, are two really better than one? Burdy loves playing with other dogs and is highly sociable. Do you think that the company of living full time with other dogs makes them happier? I'm really considering looking for a 2nd young adult v. and this would be the overriding factor? Will they enjoy life more as a pair? We have a very special needs V as our first. A male. There's just some things that didn't really get wired properly when he was created, in our opinion. When I wanted to get a companion for him everyone thought I was crazy. Now everyone is always telling me it was the best we did. They love each other, always have a play buddy and help keep each other entertained when we just aren't ready to exercise them. We love having 2 - they are best friends! We got one as a pup and rescued the other when he was 3. Go for it! You are already used to the exercise needs - that doesn't change when you have 2. 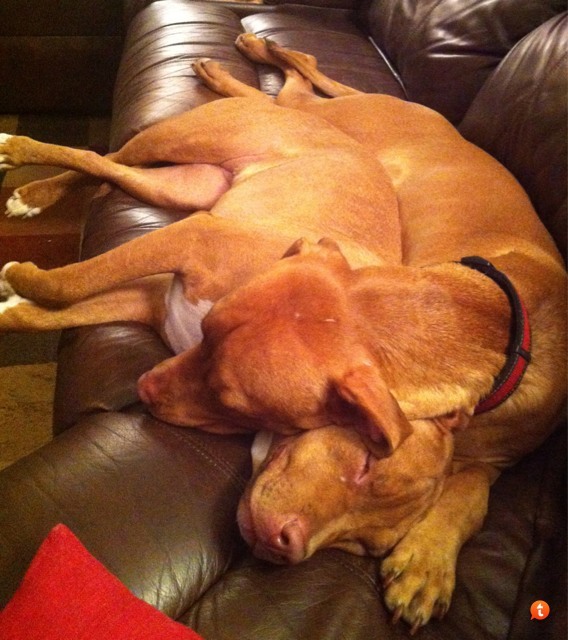 Regarding the dominate dog - the rescue is the one. Our female is perfectly fine with it too. They are perfect together. 'When I wanted to get a companion for him everyone thought I was crazy.'!! I bet they did SteelCityDozer. I can picture their responses - you want MORE of this!! They look like it's working for them from their pic. I hope it goes well Bjameson and the boys hit it off! In my experience having two is a lovefest - sometimes I feel like the outsiders. . I agree that you need to get them together and see how they get along. Both of mine are rescues and they have been in love since the first day. I love having two because they have each other for times when I'm gone at work and they also get lots of exercise wrestling and chasing each other and they are never bored because they always have a playmate. This is happening right now on my lap.